In one corner, we have the Wall Street Journal, its climate change skepticism timidly presented by Dr. Steven E. Koonin. In the opposing corner, Salon, their full throated anthropogenic global warming alarm being roared by Professor Raymond T. Pierrehumbert (who unironically ended his column on global warming with the helpful suggestion, “You cook with what you have.”). They enter the ring. They stare each other down. And now, the main event. The first reason no one wins these debates is that we’ve lost all distinction between climate science and climate modeling. Science is verifiable and repeatable. Modeling is a forecast that deals in probabilities. When someone says the ‘science is settled,’ these futurists mean that the modeling is infallible. Perfectly accurate modeling is impossible because it bangs heads with the limits of human knowledge. However, we can get a rough idea. I have no strong opinion on the climate models. (What? No strong opinion? You’re writing a blog, damnit!) Frankly, they don’t matter. That leads to the second reason no one wins these debates. These debates aren’t about science or modeling. They’re really about solutions. 1) Worldwide social engineering – Often consists of creating heavy taxes and stalling economic growth (i.e. the equivalent of slamming the emergency brake while everyone runs to the back of the bus so it doesn’t fall over the rocky ledge and send us a thousand feet into a billowing fireball at the bottom of the gorge). Writing in the Times of London in 1894, one writer estimated that in 50 years every street in London would be buried under nine feet of manure. Moreover, all these horses had to be stabled, which used up ever-larger areas of increasingly valuable land. And as the number of horses grew, ever-more land had to be devoted to producing hay to feed them (rather than producing food for people), and this had to be brought into cities and distributed—by horse-drawn vehicles. It seemed that urban civilization was doomed. The terrible horsepoopy crisis of 1944 vanished into a parallel universe once Karl Benz invented the car and Henry Ford mass produced it. The cliff is coming. Don’t slam on the brakes. 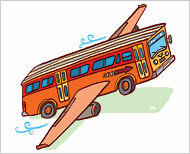 Invent a flying bus. This entry was posted in Flawed Perspectives and tagged AGW, climate change, Futurism, Horse Manure, Innovation, Napoleon Dynamite by frick. Bookmark the permalink.